Figure 8.19. DuPont's 8-Parameter Sustainable Growth Self-Assessment. DuPont also issues a separate SHE and sustainable growth progress report. The first safety, health, and environment report was issued in 1992. In 1996, the company decided that the key audience for the report was their own employees, so they reduced the size to eight pages and sent it to each employee's home, with more detailed information made available on the company's website. DuPont began reporting consistent with the Global Reporting Initiative (GRI) format in 2003, with the reports posted for the public on its website. By including detailed information on the web, the reporting is aimed at stimulating dialog with employees and community stakeholders. DuPont has shown some impressive footprint reductions since the development of their original goals and the adoption of its corporate environmental policy in 1994 and sustainable growth in 2000. Compared to the 1990 baseline, hazardous waste and air carcinogens were reduced globally by 44 and 89 percent, respectively, by 2002. Total global energy use was reduced by 9 percent, which has saved over $2 billion in energy costs since 1990. Reduction in energy use, along with reduction in chlorine and N2O emissions, contributed to 67 percent reduction in greenhouse gases over the same period. All these were achieved while production mass was increased by 30 percent. In manufacturing operations, Six sigma is driving DuPont toward greater efficiencies, resulting in the reduction of defects and elimination of wastes. In the Titanium Technologies business, for example, a quick survey indicated that 60 percent of the completed Six sigma projects could demonstrate footprint reductions. The goal of sourcing 10 percent of the global energy use from renewables, however, has proven to be challenging to achieve. Baseline of approximately 2 percent renewable energy (primarily hydropower) is currently obtained via supplier agreements. A number of projects are currently under way to develop new renewable energy sources for the company. Wind energy is being tested in a few locations, and it was shown to be economically competitive when supported with adequate government subsidies. The most cost-effective options come from the generation of steam from landfill gas and waste biomass. Proximity to and availability of these sources, however, are key (Mongan, 2003). In transforming itself into integrated science company, DuPont has divested a number of resource-intensive businesses such as energy (Conoco) and nylon and polyester fibers. It has also acquired new knowledge-intensive ventures in biotechnology (primarily agriculture and nutrition), specialty polymers, and others. DuPont is also expanding its comprehensive consulting services. Its Safety Resources business, for example, combines DuPont's strengths in protective apparel products (Kevlar®, Nomex®, Tyvek®, and so on) with DuPont's knowledge and expertise in operational safety by offering comprehensive services that include training and implementation assistance. Through product stewardship, DuPont differentiates itself in the marketplace by providing opportunities for customers to reduce their footprints. It helps customers to eliminate disposal and emission issues, such as by offering agricultural products in water-soluble packages, and lightweight polymer materials and improved coatings for the automotive industry. It also provides a market for recycled materials, such as Tyvek® from post-consumer, high-density polyethylene (i.e., milk jugs). Recycling programs for some DuPont products have also been successfully implemented, such as the post-consumer recycling program for Tyvek® banners in Malaysia, which produced an important competitive advantage and 6 percent growth in DuPont's banner and sign segment in that country. DuPont's successes have been externally recognized. DuPont was awarded, for example, the Best Environmental Practice by Financial Times in its 2000 Global Energy awards. It is recognized in socially responsible investing (SRI) indices such as the FTSE4Good Index (since 2001 inception), Dow Jones Sustainability Indexes (DJSI, since 1999 inception), and Innovest Strategic Value. In fact, it is acknowledged as the 2003 and 2004 Chemical Market Sector Leader by DJSI and rated number one in Innovest's 2002 EcoValue Model rating among 37 chemical companies. Furthermore, DuPont's collaborative research with the U.S. Department of Energy's National Renewable Energy Laboratory (NREL) on the development of biomass feedstock manufacturing of 1,3-propanediol, the key building block of DuPont's Sorona® polymer, earned it the 2003 Presidential Green Chemistry Award. Nevertheless, sustainable growth continues as a journey of transformation for DuPont. It needs to continuously navigate around emerging industry issues such as "chemical trespass" (unwanted exposure to chemicals in products) and children's health issues. These concerns go beyond manufacturing waste and emissions to product impacts on people. Recent issues concerning the EPA reporting requirement on perfluorooctanic acid (PFOA) used in the manufacture of Teflon® illustrate the challenges that DuPont continues to face. While the safety of Teflon® products were never questioned in the legal dispute, it resulted in a public relation crisis in China where rumors regarding their safety led to department stores pulling Teflon®-coated products from their shelves. Although the rumor was founded largely on misinformation, the business challenge it generated was real. On a broader view, acceptability of new technologies remains an issue that must also be anticipatively managed. DuPont, and the industry as a whole, still needs to find a good way to dialog and respond to the society's concerns around risks and benefits of new technologies. It needs to figure out what is and is not acceptable and how the debate can be framed. While DuPont is a company based on science and technology, it needs to be cautious not to force innovations faster than the readiness and acceptance levels of society. For DuPont, the business case of sustainability lies in it being a growth engine. Sustainability is the driver of innovations, both technical and in delivery to the market. Finding solutions to global societal needs, such as access to clean energy, safe food, shelter, and information, presents new business opportunities for DuPont and the industry. Sustainable growth also enhances DuPont's reputation. A large number of employees are interested in sustainable growth training programs, especially on how to make the world a better place and sharing the values of the community. Anecdotal evidence suggests that hiring of employees and employee satisfaction may have benefited from it. DuPont's reputation also opens up access to emerging economies. The DuPont crop protection business, for example, was invited to enter Vietnam due, in part, to the company's good reputation. Furthermore, DuPont believes that there are a growing number of business consumers interested in sustainability and that its progress in operating responsibly is one aspect that helps DuPont be a preferred supplier. Sustainability strengthens the company's top line and bottom line. Innovation will continue to be the primary driver in the future. Cost reductions and improvements in operational efficiency are also important, as are better community relations. In the end, sustainable growth is about finding opportunities to create value for shareholders and society, while reducing the company's footprint. For the industry, depending on where on the journey the company is, getting in line with societal expectations is the place to start. To have the right to operate and grow, a company needs to be in line with society's expectations. Business is facing unprecedented risk, scrutiny, and challenge in the face of dramatic change sweeping the world. Nowhere has this been more clearly demonstrated in the recent past than at Shell23 itself. The need to recategorize oil and gas reserves in the first months of 2004 has had wide-ranging consequences, denting public trust and damaging the Group's reputation. It will take a considerable effort to recover. But that recovery is in the sights of many employees, and central to that is a firmly held commitment to sustainable development. Only by continuing to focus on achieving a strong economic, environmental, and social performance can the expectations of shareholders, customers, and society at large be met, licences to operate retained, and the damage to the Group's reputation repaired. 23The expressions "Shell" and "Group" refers to the companies of the Royal Dutch/Shell Group of companies. Each of the companies that make up the Royal Dutch/Shell Group of companies is an independent entity and has its own identity. Shell has always been a values-driven company. Its core values of honesty, integrity, and respect for people are the foundations of Shell's General Business Principles, first codified in 1976. Having set the framework, Shell prided itself on operating to what it felt were the highest business standards. It came as a shock in 1995 when two events - the disposal of the Brent Spar and human rights issues in Nigeria - catapulted Shell into the international headlines and called into question its behavior. The Group found itself ill-equipped to deal with the public criticism and damage to its reputation and was badly shaken by these events. There was an urgent desire by senior leaders to find out what had gone wrong and why. So, in 1996, Shell embarked on one of the largest stakeholder engagement exercises ever conducted in the energy sector. It included NGOs, government officials, academics, labor representatives, and community leaders in 14 countries, who were engaged in a series of 20 or so roundtable discussions. Gradually, through the process Shell learned to "bite its tongue," stop defending, and listen. The roundtables were followed by a quantitative survey of 7500 members of the public in 10 countries, 1300 opinion formers in 25 countries, and 600 Shell employees. The results made salutary reading. They showed that a significant minority had serious concerns over what they perceived as Shell's lack of regard for the environment and human rights. As Managing Director Mark Moody-Stuart said at the time "we looked in the mirror and neither liked nor recognised what we saw." What was clear from the evidence was that having values is not enough. The way values are expressed, as behavior, needs to be constantly refreshed to reflect changing public expectations. In today's world, there are growing calls for companies to move beyond being responsible to shareholders for financial performance and become accountable to stakeholders for their wider economic, environmental, and societal impacts. The risk is that if customers believe that a company is not behaving ethically they are more likely to vote with their wallets and make their protest known by boycotting products or services. At a time of unprecedented scrutiny for companies, made easier by the CNN/Internet world, there is simply "no hiding place." A second key learning was that the world was moving from a "trust me" to a "show me" world. People are less willing than they were to take the assurances of authorities such as government, scientists, and companies on trust. There is an increasing call for corporations to show what it is they are doing. And in the absence of trust - something that characterizes the modern world - there is a demand for independent verification of what is being shown. 24The Group is organized into five Businesses. Businesses are portfolios of activities operating according to common objectives and strategies. One such Business is the Chemicals Business. Against this backdrop Shell saw there was a growing worry in society about the long-term social and environmental "sustainability" of today's economic development. The powerful forces of globalization, liberalization, and technology have brought rapid change and advancement. But the speed and scale of the impacts are posing far-reaching questions. They are also exposing dilemmas and threats as they push the boundaries of natural and man-made systems. People are concerned about climate change, erosion of ecosystems, issues of health, and extremes of poverty and wealth. With the global population set to rise by 50 percent and global energy demand expected to double or even triple by 2050, there is a real sense of urgency and alarm at the prospects for the planet and its future generations. Shell recognized more clearly than before the implications of this to the future success of the Group. It also saw its wider responsibilities to the societies it serves. There was a clear imperative to respond. Shell's first response to these findings was the acceptance by senior management that they were important. The second was to face up to the fact that this would require some significant changes to the way the business operated. Clearly, that required getting a few basics in order. The first, in 1997, was the updating of the Shell General Business Principles to include specific commitments to support fundamental human rights and to contribute to sustainable development. At the same time the health, safety and environment (HSE) commitment, policy and procedure was greatly strengthened. Strict governance and clear processes were put in place to ensure adoption and compliance with these measures worldwide. A global issues identification and management system was developed and a Social Responsibility Committee at Board level was established to review the overall social and HSE performance and policies of the Group. The Business Principles were translated into 51 languages covering 99 percent of Shell people. Minimum environmental expectations were laid down, based on norms in OECD countries, defining the standards of performance to be applied wherever Shell operates. Group targets were set for reducing greenhouse gas emissions to 10 percent below 1990 levels by 2003, and for ending venting of gas by 2003, and continuous flaring by 2008. Shell Renewables was set up to grow a viable business in solar, wind, and other forms of alternative energy. After making these moves people said "great intentions - now show us the performance!" This led to the first Shell Report "Profits and Principles - does there have to be a choice?" published in 1998. Overnight it broke the mold on Shell's corporate reporting. It sought to be an honest, transparent, and verified account of Shell's environmental, social, and ethical performance worldwide. It surprised many people, including Shell's fiercest critics, with its frankness in discussing the most sensitive issues facing the Group such as climate change, operating in politically sensitive areas, and dealing with the legacies of past industrial activity. It acknowledged where mistakes had been made and lessons learnt. The decision to produce the Shell Report was evidence of a greater commitment to openness and transparency - an acknowledgement of the "show me" world. That meant a willingness to engage with groups that had not traditionally been informed or involved in business decisions. That in turn would help ensure that the values of the company continued to be sensitive and responsive to public expectations. With time this would go a step further and begin to open up an "involve me" world. These moves were part of a wider strategy of ensuring Shell was fit and competitive for the 21st century. It was the beginning of a journey, one based on a core conviction that business had an essential role to play in finding new ways of meeting present and future needs that were more socially and environmentally sustainable. After getting the foundations in place, the next step was to understand more clearly what this meant in practical terms and then to integrate sustainable development thinking across the Group in a structured and consistent way. This was a real challenge given the diversity of Shell's operations (spanning five Businesses) and the range of environments in which it works. It was clear that this would only be successful if all those who worked for and with Shell understood what sustainable development meant to Shell and how they could contribute. A difficulty was that there was very little understanding of what such a commitment meant. There had been a long tradition of social investment by Shell in the communities in which it worked, but this had tended to be philanthropic and seen as an optional extra. What was now being established was a different way of doing business. This would entail integrating environmental and social aspects into the mainstream of the Group's activities along with economic considerations. It also required the balancing of short-term priorities with longer-term needs, and a willingness to engage the outside world in the decision-making process. This meant asking those impacted by Shell's activities what they thought at the beginning of new activities rather than telling them what had been decided at the end. There was undoubtedly significant skepticism at the outset on the need to make a commitment to sustainable development. "Why us now? Most of our competitors seem to be doing well if not better without it" was a common retort. And "What about the shareholder? Companies are not charities. Surely the prime responsibility of any corporation is to its shareholders?" This sentiment was driven by the widely held perception that although the moral case was clear, such a commitment might mean additional burdens on the business and therefore make it less effective. People would need to be convinced of the value of this approach. There was a need to demonstrate that the best way of serving shareholders is, paradoxically, not to focus exclusively on the shareholder. There was a need to make the case that the best way of maximizing long-term total shareholder returns is by taking a wider perspective of the expectations placed on a company - and thus avoiding risks that destroy value - and grasping future opportunities that create value. At the heart of the effort to convince the organization that this was a sensible way to proceed was the need to show how a commitment to sustainable development could add value to the business - to present the business case for sustainable development (SD) in the same way as for any other element of the Group's activity. As these components are so fundamental to the internal understanding and acceptance of SD, it is worth providing further insight into each one. Attracting and motivating employees. Most people want to work for a company whose values and concerns are aligned with their own. As competition grows for talent, this can provide a real competitive advantage. Reducing costs through efficient use of materials and energy. This spurs innovation and helps reduce costs through eco-efficiency. It means finding cost-effective ways to produce more with less material, energy, water, and waste, and turning waste into saleable products. Reducing financial risks. This is concerned with reducing risk by understanding what stakeholders see as responsible behavior and meeting those expectations. Gaining speedy approvals from government for major multimillion dollar projects, for example, and gaining a "license to operate" from local communities can save substantial amounts of time and money. Demonstrating the ability to manage risk is attractive to financial institutions, leading to lower cost of capital and improved confidence among investors. Steering the portfolio for the future. Anticipating new markets, driven by societal and customer desires for a cleaner, safer more sustainable world, can give strategic direction to the evolution of product portfolios and supply chain relationships to match. Influencing product and service innovation. Sustainable development provides a lens that can be used to understand the wider impacts of a business and foresee future impacts. Understanding changes in customers' lifestyles, values, and their sometimes conflicting priorities gives a direction to product and service innovation and differentiation. Attracting more loyal customers. It is essential that suppliers consistently understand and meet their customers' needs. This is about anticipating how those needs will change, but also about giving customers confidence that their suppliers will do their part in looking after the value chains in which both parties are involved. Enhancing our reputation. By being seen as a credible, good corporate citizen whose performance matches its words, the company becomes first choice for customers, staff, investors, suppliers, partners, and communities in which it operates. Having a good reputation is a clear advantage in a business climate where it is increasingly clear that failure to safeguard reputation has long-term financial consequences. It not only secures a "license to operate," but more crucially a "license to grow." In the early stages, Shell's understanding of how contributing to sustainable development could be a "win-win" was limited to a few who had had the opportunity to explore the concept more deeply. It was understood that it would be wrong to try to prescribe from the center how the sustainable development approach should be applied in detail in each and every operation. Instead, a guide was developed called the Sustainable Development Management Framework. This described the case for sustainable development, what it meant for Shell and provided practical guidance on how to apply its concepts. It was intentionally distributed by the businesses, not from the corporate center, to emphasize that its implementation was to be owned and managed by the businesses. Local adaptation and exploration was encouraged and emerging best practise shared. At the same time as the framework was being rolled out, the Chemicals Business was putting in place a new operating model that would define its core business activities and provide a backdrop for decision-making (Fig. 8.20). It was agreed that SD would be placed at the heart of this model, emphasizing that SD is "the way Shell chemicals companies do business." • Reducing our footprint is concerned with reducing emissions, waste, energy, and other resources. Examples include an "Energize" programme that advises manufacturing facilities on ways to reduce energy usage and the sale of waste CO2 to manufacturers of carbonated drinks. • Sustaining value chains is about finding ways to make the value chains in which Shell chemicals companies participate more sustainable. Examples include the development of cool wash detergents, and the PETFix technology to recycle waste PET drinks bottles into building materials. • Building social capital is about engaging with external stakeholders, such as local communities, and supporting employees. Examples include a job creation program at Berre, where site facilities were offered for use by start-up companies to create new jobs, and the promotion of diversity among employees. Figure 8.20. New operating model for the Chemicals Business. • Creating our future reflects a commitment to innovation and to delivering solutions that respond to society's evolving needs. 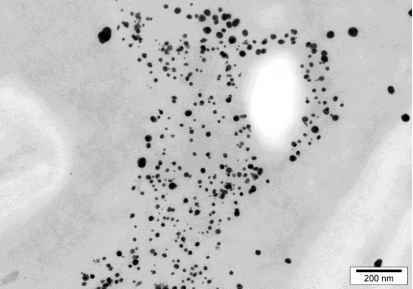 Examples include a new technology to produce monopropylene glycol, with higher efficiency and less water, using CO2 as a starting material rather than propylene, and searching for a new process for making organic carbonate that would avoid the need to use phosgene in polycarbonate manufacture. The Chemicals Business and other Group Businesses still have much to do, but good progress has been made in a number of areas including integrating sustainable development considerations into the business decision-making process. For example, any new investment proposal has to include the cost of carbon in the economics. This drives investment in the most energy-efficient technologies, improves competitiveness, and prepares for a time when there will be a financial penalty for carbon use. This is in addition to a requirement that all project proposals must have an assessment of the environmental, health, and social implications in submissions for capital allocation. The hard wiring is reinforced in internal communications, training, and development of Shell people. There is a particular recognition of the new skills required by leaders within the organization, many of whom have engineering and technical backgrounds and who have had little experience of, for example, engaging with stakeholders. A better understanding of the social and environmental factors may mean not pursuing the most obvious technical option if it has too high an environmental or social cost. The re-routing of pipelines to avoid sensitive areas is a case in point. That makes it essential to provide learning opportunities to help managers deal with what are often complex dilemmas. That exposure is provided both within the organization but also with the help of external providers. Recognizing that sustainable development is still a relatively new concept for business, Shell supports a number of academic institutions in their provision of leadership development and research into approaches to sustainable development within business contexts. The embedding process is reinforced by appraisal and reward systems. Since 1997, contributing to sustainable development has counted in the remuneration of Shell's most senior executives and in the appraisal of Group Business. Similar reward schemes are adopted across Shell's operating companies, providing very powerful incentives to operate in a sustainable way. The Shell Report, by reporting environmental and social performance, also underlined the way the old adage that "what gets measured gets done" is as true for integrating sustainable development as it is for any other business need. This focus on measurement meant that a set of key performance indicators was developed to measure and drive progress in critical areas of economic, environmental, and social performance. They serve as the logical basis for the setting of targets and milestones and for developing standards of reporting and verification for the Shell Report. The indicators include quantitative measures such as Return on Average Capital Employed, greenhouse gas emissions, and diversity in the organization. They also include qualitative measures such as stakeholder views on the acceptability of environmental performance, and wider measures of reputation. • alignment of business processes with SD increased by 40 percent. Progress against the goals is shared annually with all employees, and corrective actions agreed as required. One of the key changes that a commitment to SD has delivered is an acceptance that it is necessary to involve external stakeholders in dialog and the decision-making process right from the start of a project. That involvement varies from specific engagement on the particular implications of a new project, to work on overall policy themes such as human rights. Some of this work has led to partnerships with international organizations on major issues such as biodiversity or climate change to ensure that Shell has access to the widest expertise and is in touch with the latest thinking in these areas. On biodiversity, Shell is working with partners ranging from the IUCN to UNESCO on policy development, and with the Smithsonian Institution on the effect of oil operations on the local environment in Gabon. In addition, it works with industry partners to develop and share best practice. Informed by these relationships, Shell developed a biodiversity policy, which applies across the Group. It led it to announce, in August 2003, a commitment not to explore for oil and gas in Natural World Heritage sites. This was welcomed by many conservation groups and helps to create a situation where Shell is seen as being a legitimate part of the overall debate on where it is acceptable for extractive industries to operate. On human rights, Shell has established a regular dialog with groups such as Amnesty International and Pax Christi. This helps to inform Shell's approach and to develop understanding of the challenges and dilemmas faced by the business when operating in sensitive countries. A range of training materials has also been developed on issues including child labor, bribery, and corruption, and working with indigenous people. All of these help to provide practical support and guidance to staff on the ground so that they can take appropriate action to deal with local conditions and uphold the highest standards of behavior. This is a part of a wider ongoing debate with international NGOs and forums such as the International Chamber of Commerce, the European Roundtable, and the World Business Council on Sustainable Development (WBCSD), where Shell is a leading player. The WBCSD has undertaken a considerable amount of work on many of the key issues such as energy and climate, biodiversity, and corporate accountability and reporting. By drawing together best practice, this helps individual businesses keep up with the leading edge of thinking and gives business a stronger role in the debate by providing a consistent and authoritative voice. What is emerging from this continuing debate is that there is an increasing recognition that business is part of the solution to sustainable development questions. This was acknowledged at the 2002 World Summit on Sustainable Development in Johannesburg, where business embarked on a range of partnerships that will have a very practical benefit for significant social and environmental problems. These include poverty alleviation through economic development and energy provision. As Kofi Annan, Secretary General of the United Nations, put it at the Business Day of the Summit: "Business leaders now understand that companies can only succeed long-term if they put values at the heart of their business and address social and environmental issues in a sustainable way". He added, "the corporate sector need not wait for governments to take decisions. It is only by mobilising the private sector that we can make progress." There are, of course, some who believe that business and the oil and gas business in particular cannot act in a sustainable way. A common challenge to Shell is "How can you claim to be committed to sustainable development when you go on exploring for oil and gas? That simply doesn't add up!" To answer that, one needs to go back to where the concept of sustainable development came from and its purpose. It was the Brundtland Commission of the United Nations in 1987 that defined sustainable development in inspiring but very open-ended terms as "development that meets the needs of the present without compromising the ability of future generations to meet their own needs." Crucially, it acknowledged that economic development was necessary to generate the wealth for cleaner, more efficient technologies, and social improvement. Going back to pre-industrial times was not the answer to the world's problems. As "economic engines," companies clearly have a role to play. That is why Shell's commitment is couched in terms of contributing to this wider movement of sustainable development. Shell did not pretend that it could become sustainable in the sense some people ascribe to the term as in only using renewable or recyclable resources, and only supplying renewable forms of energy to its customers. This is simply unrealistic with hydrocarbons set to remain the mainstay of the energy scene for at least another three decades. But what Shell felt it could do is continually improve its performance across the three dimensions of sustainable development: economic, environmental, and social, and use this approach to give purpose and impetus to its strategic direction as a progressive energy company. Shell saw that it could contribute in three ways using the fourth dimension of sustainable development - time. This perspective provides a readily understood framework for action for people who ask "What can I do on Monday morning?" The first way is to look back in time and "learn the lessons of the past." This can involve bringing standards up to date, cleaning up legacies, and retrofitting sustainable development thinking to older operations. It is the least glamorous way of contributing. It is a cost and a distraction from current operations. Nevertheless, it is an essential starting point and payback is achieved through reduced risk of liabilities, and a protected reputation. The second way is in the present - doing things better now. This generally involves incremental improvements to how things are done such as making products or processes cleaner and safer or in managing major projects in a more informed way. An example of the former is the development of a new process that allows some of the waste water produced in the manufacture of styrene monomer and propylene oxide (a combined process) to be recycled back into the production process. Applying this process at a plant in Singapore - where fresh water is a very precious resource - has reduced fresh water use by 9 percent. An example of the latter is the development of the CSPC-Nanhai petrochemical project in China. This development between Shell and its Chinese partners is, with an investment of $4.3 billion, the largest ever Sino-foreign joint venture. Some 2.3 million tonnes of product will be produced in the plant each year, feeding local demand from manufacturers of telephones, TV sets, computers, cameras, car components, and so much more. From the outset, the project presented a number of social and environmental challenges and the joint venture, in which Shell has a 50 percent share, has worked closely with the local government to meet them. In particular, great care has been taken to ensure that the resettlement of households has been carried out to international standards, with a range of livelihood restoration initiatives put in place. Resettlement has been monitored by external observers and publicly reported. It is hoped that the processes developed at Nanhai, and the lessons learned, will provide a valuable model that can be applied to other projects in China. The third way is to look forward in time and redesign for the future. This is the most inspiring and far-reaching way of contributing. It involves "thinking outside the box" and seeking answers to fundamental questions of sustainability. This can lead to new products and services, new supply chain relationships, and portfolio evolution. For Shell this has led to looking at how to radically reduce the impact of the production and use of oil and gas and helping the world shift towards a low-carbon energy system. In practical terms this means growing Shell's natural gas business, while working to make solar and wind power competitive and supporting the development of an infrastructure for hydrogen fuels. Other developments include new fuels from crops (biofuels), and finding ways of capturing greenhouse gases from fossils fuels cheaply. Shell believes there is a compelling business case for sustainable development. It has learnt from experience - no more so than in the first half of 2004 - that companies need to embrace the challenges of heightened expectations and increasing demands for openness and transparency. They need to do this if they are to secure the long-term growth and success of their businesses. It is also clear that this commitment needs to be maintained in both good and bad times. The challenge of achieving a sustainable world is huge and daunting, but there is no alternative. No one group will have all the answers, and partnerships will be even more essential in ensuring that the full range of perspectives and views are received and pursued. The organizations that succeed in today's fast-changing world will be those that have strong core values but that are committed to developing and refining those values; they will be those that are humble enough to accept that they do not have all the answers; they will be prepared to be transparent about their mistakes, and work with others, even their critics, to improve the way they operate. Companies that learn to do so will be those that are best placed to avoid the risks and seize the commercial opportunities ahead. BASF is the world's leading chemical company. We offer our customers a range of high-performance products, including chemicals, plastics, performance products, agricultural products, and fine chemicals, as well as crude oil and natural gas. BASF manufactures and sells more than 8000 products and has grown into a very successful company since its birth in 1865. BASF operates production facilities in 41 countries and maintains contact with customers in more than 170 countries. The BASF Group encompasses BASF Aktiengesellschaft with its parent plant in Ludwigshafen, Germany, as well as over 160 subsidiaries and affiliates. In 2003, BASF had about 87,000 employees worldwide. Responsibility towards society and the environment is a key element of BASF's corporate philosophy. This philosophy is based on the principles of Sustainable Development. Sustainable Development is anchored into our "Values and Principles" and BASF commits itself to the principles of the United Nation's Global compact initiative. For BASF, Sustainable Development means being committed to helping meet the needs of society today without compromising the ability of future generations to meet their own needs. It also includes an open dialog within the company, with its business partners and neighbors, and with society. The principles of Sustainable Development are important for BASF to operate successfully in a global competitive environment. The economic importance of Sustainable Development is acknowledged by financial markets. Implementing Sustainable Development is a challenging task for a transnational company. Economic, environmental, and social conditions vary from country to country. This means that on one hand we need to develop strategies and tools that can be applied worldwide, and on the other hand these strategies and tools must be flexible enough to conform to the requirements of a given country - something that is particularly challenging in the social context. It was essential to establish suitable management structures to support the implementation of Sustainable Development worldwide. Examples for BASF's implementation include Responsible Care®, long-term global environmental goals, the "Verbund" structure, and innovations. In the following, the implementation and practical handling of sustainable development within BASF is presented in more detail. Furthermore, an important instrument, the eco-efficiency analysis, is described. BASF was one of the first chemical companies to develop this method for use in its business activities. Our commitment to sustainability is integrated into the "Values and Principles of the BASF Group." It is a core component of the conduct that is binding for all our employees. As the world's leading chemical company, it is our mission to benefit our customers, our shareholders, our company, our employees, and the countries in which we operate. BASF's values describe the orientation and the manner in which we want to reach our goals. The first of six values states: "Ongoing profitable performance in the sense of Sustainable Development is the basic requirement for all our activities. We are committed to the interests of our customers, shareholders and employees and assume a responsibility towards society." The Global Compact initiative was established by UN Secretary-General Kofi Annan in 2000. As a founding member, BASF has committed itself to promoting and implementing the Global Compact's nine principles. These principles formulated by the United Nations extend from the demand to put human rights principles into practice, through respect for trade union rights to the encouragement and spread of environmentally friendly technologies. These are principles on which sustainable development is built. BASF's Board of Executive Directors established the Sustainability Council in June 2001. 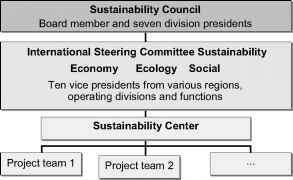 The Sustainability Council (Fig. 8.21) is chaired by a Board member and ensures that BASF Group policy is in accord with the principle of sustainability. The key task of this Council, whose members include seven division presidents in addition to the Board Member, is to draw up strategies for the three aspects of Sustainable Development: the economy, the environment, and society. Figure 8.21. Organization of sustainability management in the BASF Group. To implement strategic decisions, the Sustainability Council is supported by the International Steering Committee Sustainability. Its ten members, senior executives from various regions and disciplines, reflect the range and diversity of the BASF Group and the significance of the topic. They plan and oversee strategy implementation. A number of task-specific project teams report to this Committee and draw up specific measures. The Sustainability Center acts as an interface between the Sustainability Council and the International Steering Committee. It coordinates various internal projects and teams and is responsible for BASF Group communication on sustainability. The BASF Group's Responsible Care® initiative consists of many elements, two of which are described in more detail below. Site Audits. Regular site audits carried out on behalf of the Board of Executive Directors are an important means of answering questions regarding the success in implementing Responsible Care® goals. These audits are essential for an assessment of the actual improvement with respect to the Responsible Care® goals. They also contribute to the identification of areas with room for further improvement. When auditing a site or a plant, we rely on clearly defined criteria to produce an environmental and safety profile. Separate audits are conducted to determine the occupational health conditions at a facility. A site's performance profile covers both "hard facts" such as accident numbers and emission levels, as well as "soft facts" such as effective organizational structures, defined responsibilities, and a culture of safety or safe practices. In addition to the environmental and safety profile, an audit generates a risk profile for a site, based on the materials and processes used and the facility's immediate surroundings. A risk matrix helps illustrate the results and shows whether additional measures are needed. An Example: Responsible Care in Raw Material Purchasing. In 2002, BASF bought more than 10,000 different raw materials from about 5000 different suppliers worldwide. Along with price, quality, and reliability, compliance with specific environmental, health and safety standards is a precondition for our business partnerships with raw materials suppliers. Our purchasers negotiate terms, but also evaluate the risk associated with each product and supplier. For this purpose, we have developed a safety matrix (Fig. 8.22). According to this matrix, all raw materials purchased are classified into one of three hazard categories according to their environmental, toxicological, and safety properties: A (safe), B (harmful), or C (e.g., toxic). For example, sodium chloride belongs to category A. Ethanol is classified as highly flammable, therefore it is part of category B. Methanol, a highly toxic type of alcohol, belongs to category C.
Suppliers and potential suppliers are classified with respect to expected or known compliance with environmental and safety standards. In a first approach, this classification is performed according to their location in OECD countries or non-OECD countries, since the risk of noncompliance with environmental and safety standards is expected to be higher in non-OECD countries (Kranz and Sargasser, 2003). Products/producers assigned a C3 rating represent a potentially high risk and are therefore subjected to a particularly careful check. This means that BASF employees visit the supplier and carry out an EHS assessment to determine whether the supplier's plant operates according to Responsible Care standards. A company can only be included in our list of suppliers if its facilities meet our requirements. Figure 8.22. Safety matrix of raw material purchasing. long-term business relationships with its suppliers. Therefore, suppliers' compliance with international standards is a clear benefit for them. The procedure is part of our risk management and we are convinced it represents a competitive advantage for BASF. 8.6.4.2 Long-Term Global Environmental Goals. We have already successfully reduced our emissions to air and water by continuously increasing the efficiency of our production processes and energy generation. For example, between 1990 and 2002, BASF Group worldwide reduced greenhouse gas emissions by 38 percent in absolute terms. In the same period, production increased by 45 percent. As a result, we more than halved greenhouse gas emissions per metric ton of sales product (61 percent reduction). However, we want to do even better. In order to ensure transparency of the process of improvement, we have published long-term global environmental goals that we want to achieve. By 2012, BASF plans to cut emissions of greenhouse gases by 10 percent per metric ton of sales product and emissions of air pollutants from its chemical plants by 40 percent compared with 2002. We will also reduce emissions of both organic substances and nitrogen to water by 60 percent and heavy metal emissions by 30 percent. BASF additionally plans to significantly improve its safety record by 2012. The goals are 80 percent fewer lost-time accidents compared with 2002, and 70 percent fewer transportation accidents compared with the value for 2003. By 2008, BASF intends to extend its data on chemical substances even further to include the relevant information on all substances handled worldwide in volumes exceeding one metric ton per year. 8.6.4.3 The Verbund. The "Verbund" is an integral part of BASF's corporate philosophy. It was the original idea of BASF's founder, Friedrich Engelhorn, to link each production facility to other plants so that the products, byproducts, and waste streams from one plant could serve as feed in the next. Production plants in this Production Verbund are connected through an intricate network of piping that provides an environmentally friendly method of transporting raw materials quickly and safely. This way, BASF created efficient value-adding chains, starting from basic chemicals and extending to higher value products like coatings and crop protection products. In the Energy Verbund, excess heat from chemical reactions in production plants is converted into steam. This is fed into the steam grid and thereby becomes available to other plants. Thanks to the Energy Verbund, we could reduce the use of fossil fuels at our main production site in Ludwigshafen by 49 percent compared with the mid-1970s, while production increased by 45 percent in the same period. This Verbund structure successfully combines environmental protection with economic advantages. Verbund, however, has taken on a much wider meaning for BASF. It also encompasses the Procurement Verbund, Knowledge Verbund, Verbund with customers, and so on. 8.6.4.4 Innovation and Sustainable Development: Example "Three-Liter-House." With innovations based on chemistry, we are helping to put the principles of sustainability into practice. Innovations from BASF make our customers' products and systems as well as their entire production processes environmentally sounder, and help save resources. As an example, BASF is contributing to sustainable urban development with its innovative "three-liter house" concept for the low-energy modernization of older buildings. Using a number of innovative products, technologies, and systems, we have developed a process for refurbishing old buildings such that the energy demand for heating is reduced to a fraction of its original value, even below the minimum requirements for new buildings. A model project in the Brunck district of Ludwigshafen has already proved the concept's value. A renovated old apartment now requires just three liters of heating oil per square meter per year instead of the 20 to 30 liters needed in unrefurbished older buildings. Optimal thermal insulation is the most important part of the project. Primarily, this was achieved by employing products such as BASF's new insulating material, Neopor®. Further elements are an air exchange system that allows 85 percent of heat to be recovered, special thermal control windows, and an interior plaster that stores heat and ensures a pleasant indoor climate. In addition, a fuel cell provides heat and electricity highly efficiently, with a low level of emissions. Meanwhile, three years after the launch of the project, the three-liter house has received international acclaim. It serves as a best-practice model for energy-efficient modernization and urban development for the European Union's SUREURO research project into sustainable urban development.